We are a bunch of losers for sure. We finally went to see a show, other than a concert, here in Las Vegas. We have lived here 7 years. 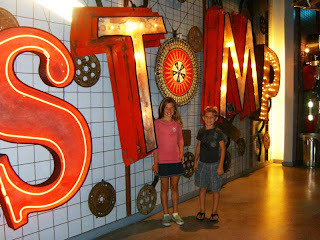 The kids and I got tickets to Stomp Out Loud for Bill for Father's Day. 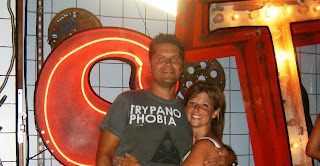 We went last night, and had the best time ever. About 1/2 hour into the show Hannah asked what time it was (which made me a tad angry) and Connor seemed more interested in his Starburst candies (which made me a tad more angry) but then both kids seemed to totally get into it. It was a fantastic show!!!! Some of the cast came out and took pictures with the fans. 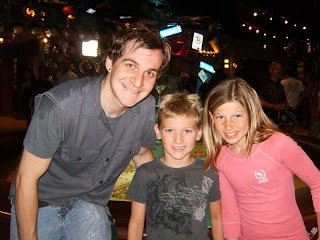 Here was one of our favorite performers with Hannah and Connor. The entrance to the show had so much cool stuff to look at, too. Thanks for taking me to STOMP.. loved it!! it was a blast. Gin, nice picture of you and I!! we don't have many of those. I can't believe that's the first show you guys have gone to. So, does that make you tourists, now? 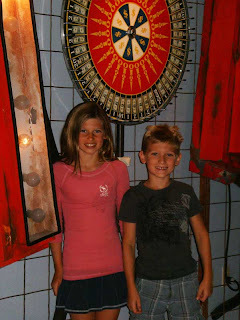 Love the picture of you guys. Yes, the last pic is awesome and Gini your hair is SO CUTE! But that dress you had on was so sweet I am sad that we don't get to see it in the pic and what is Trypano Phobia??? ?